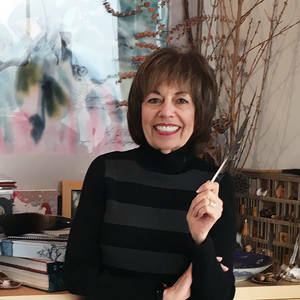 The following day, on May 26th from 10am to 1pm, Nan Rae will teach 35 students the basics of painting floral subjects using Chinese brushes, paper and colors. Co-organized by Greenspace and Allied Arts of Cambria, the fee for the workshop is $50, which includes all necessary supplies. Because Nan Rae’s workshops at the Huntington Botanical Gardens in San Marino sell out quickly, interested parties are advised to make reservations soon. To learn more about Nan Rae, please visit her website or view her short demonstration videos on Instagram. Both of these events are being coordinated by John Seed. Curator Seed comes to Greenspace after a long career as a professor of art and art history; he has a deep interest in Chinese art and often writes for Arts of Asia magazine. He'll be present when Greenspace opens the Chinese temple to the public for Nan Rae's demonstration on May 25th. Greenspace is very pleased to be working in partnership with Allied Arts of Cambria in bringing Nan Rae to Cambria.